We enjoyed the location and the size of the hotel. The attached restaurant was excellent. I’ve stayed here three times this year. I love the location and the charm. The staff is always welcoming and kind. Be sure to grab a Hershey Kiss or two from the lobby! Nice hotel and good location. Our room was extremely small and there was no place to put our luggage, so it stayed on the bed while we slept. Nice hotel, very downtown but good location. Smells good and is clean and lovely. Attached to Serafina which is a plus! great hotel, great location, great bar downstairs. I got there around 12.30 and was told I could only have my room at 3 pm. Bathrooms are also really small so not suitable for overweigthed persons. Why is there no unsubscribe button in your orbitz emails? Great location, clean, friendly. I was in a pinch and pulled an all night at work, grabbed a room close to wtc and this did the trick. Great location, easy access. Staff quite pleasant! We booked this hotel at this last minute (the morning of). For under $200 a night in Manhattan, it was a quaint lovely stay! Staff was very nice! Great, safe location! Cute rooms even if on the small side. Perfect for a short stay in the city! 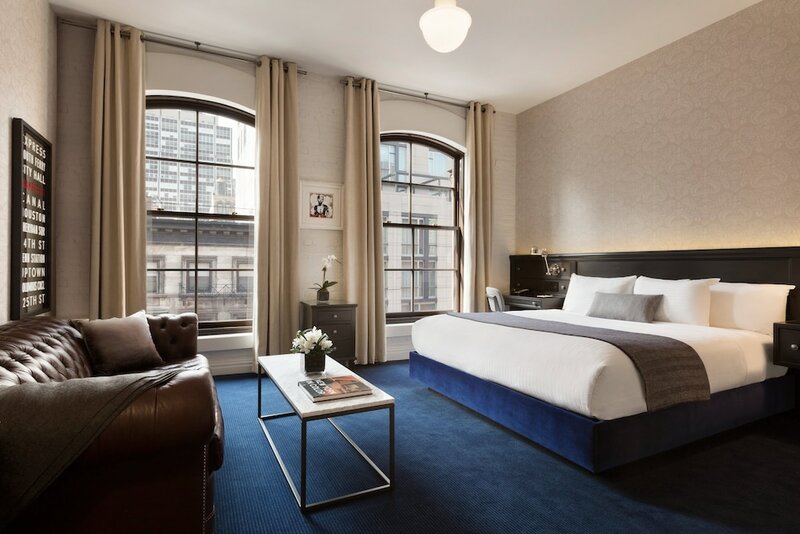 Located in Tribeca, The Frederick Hotel is within a 10-minute walk of popular sights such as National September 11 Memorial and One World Trade Center. This 4-star hotel has 130 guestrooms and offers conveniences like a restaurant, a 24-hour fitness center, and free in-room WiFi. Enjoy a leisurely bite to eat at the onsite restaurant, or have a drink at the bar/lounge. Savor a meal from the comfort of your room with room service. Continental breakfast is offered for a fee each morning from 7 AM to 11 AM. A flat-screen TV comes with cable channels and pay movies, and guests can stay connected with free WiFi. Beds sport Frette Italian sheets and the bathroom offers a hair dryer and designer toiletries. Other standard amenities include free newspapers, a safe, and a phone. Guests of The Frederick Hotel enjoy features like a 24-hour fitness center, free WiFi in public areas, and free newspapers. Valet parking is available for USD 65 per day. Multilingual staff at the 24-hour front desk can assist with dry cleaning/laundry, concierge services, and luggage storage. Continental breakfast is served daily from 7 AM to 11 AM for a fee. Recreation features at The Frederick Hotel include a 24-hour fitness center. Book a stay in any room or rate category and receive the following benefits included in the resort fee: Fredrick's happy hour hosted twice weekly from 5:30-6:30 PM with small bites and drinks; New York Times or Wall Street Journal newspaper; access to the fitness center; weekly neighborhood walking tours by Streetwise; bottled water upon arrival; and 5% off at Serafina restaurant.